It was a productive week. I feel much better about having things ready for the photo shoot for the Fall issue. I shipped off three garments & accompanying patterns...Wine Dark Sea, Long and Loose Cardigan and Easiest Sweater Ever!. I've started the jumper which I think I am really going to like. I will have more sense not to propose so much for the next issue. Lessons have been arriving regularly and so far, I've been able to send them out the day I receive them. I may procrastinate about many things but never my correspondence course lessons. I think my students want their feedback immediately. Last week I discussed right and left slanting decreases since my students had some difficulties with them. This week, I will do right and left slanting lifted increases. I have done several videos on how to make these increases so you may want to check the index page for more blog entries if you haven't used this type of increase before. Right and left lifted increases get their name from how they are made. Right slanting are made in the right leg of the stitch below the stitch on the needle. The opposite is true for the left slanting. When they are mirrored, the right slanting is worked on the right side of the piece and the left slanting on the left side. I never reversed this until today. Here is a photo of how they look with the right ones on the right and the left ones on the left. Notice how the right leg of the stitch used for the increase is elongated and how these elongated legs form a line slanting towards the right. The same is true on the left. These increases should be mirror images of each other. Here is the Long and Loose Cardigan, back and front. The band around the neck and fronts is a reversible cable pattern. This is the Easiest Sweater Ever!, the Confident Beginner pattern. The front and backs are just rectangles. There is some shaping for the sleeves. All the edges roll. It is a quick knit. The article focuses on how to finish it. I wanted a very wide boat neck but you could make it more narrow. I'm making progress on the jumper. 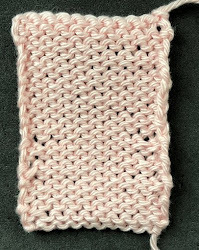 There is a Half Linen Stitch bottom band which will match the pockets. Anyone who has done Level 2 of the Masters Program will recognize the pocket technique. There will be exposed zippers at the top of the pockets. I should have it finished by next week.